The Community of Pelzer Historical Society (CPHS) has graciously allowed us to reprint an article that appeared on their website in January of 2010. Please take a few minutes to visit their website at www.historicpelzer.org and if you’d like more information about that area of South Carolina, contact Beth at beth@historicpelzer.org. Late in the afternoon of August 15, 1591, two small ships sailed into the bay at Hatorask (Hatteras)and dropped anchor some three leagues from the shore. As twilight fell one of the voyagers paced the deck restlessly from stern to stern. The voyager was John White, Governor of Sir Walter Raleigh’s Roanoke colony, who was finally returning to the little band of English settlers, among them his own daughter, whom he had left nearly four years before to return to England for supplies. Upon first coming to anchor in the place where the Colony were left in 1587, John and the others saw ..”..a great smoke..”. This had them in high hopes that all was well and that the colonists were in John’s words..”…there expecting my return out of England.” John found no sign of the colonists at the site. An agreement had been established between John’s group and the colonists in which in the event that the colonists were to run into any trouble, they would ..”carve over the letters or name a Cross in this form (a Maltese cross with arms of equal length..) There were no such signs of distress. After exploring at least two signs of smoke, which led to no positive result, John White and his group closely observed at the site “…in all this way we saw in the sand the print of the Savages’ feet of 2 or 3 sorts…and as we entered up the sandy bank, upon a tree, in the very brow thereof, were curiously carved these fair Roman letters CRO: which letters presently we knew to signify the place where I should find the planters seated, according to a secret token agreed upon between them and me at my last departure from them; which was, that in any ways they should not fail to write or carve on the trees or posts of the doors the name of the place where they should be seated; for at my coming away they were prepared to remove from Roanoak 50 miles into the main.” White was disturbed to find that the houses had been taken down and in their place built a “..high palisade much like a fort…”. After closer inspection, White found “..one of the chief trees or posts at the right side of the entrance had the bark taken off, and five foot from the ground in fair Capital letters was graven CROATOAN without any cross or sign of distress..” There were a few items found and the area was nearly overgrown with grass and weeds. John White and his men ended up sailing back to England and any other search was abandoned. Thus, the Roanoke Colony became the famous “Lost Colony” in American history. It should be remembered that this colony included the first child born of English parents in the new world, Virginia Dare, daughter of Eleanor, herself the daughter of John White, and Ananias Dare. 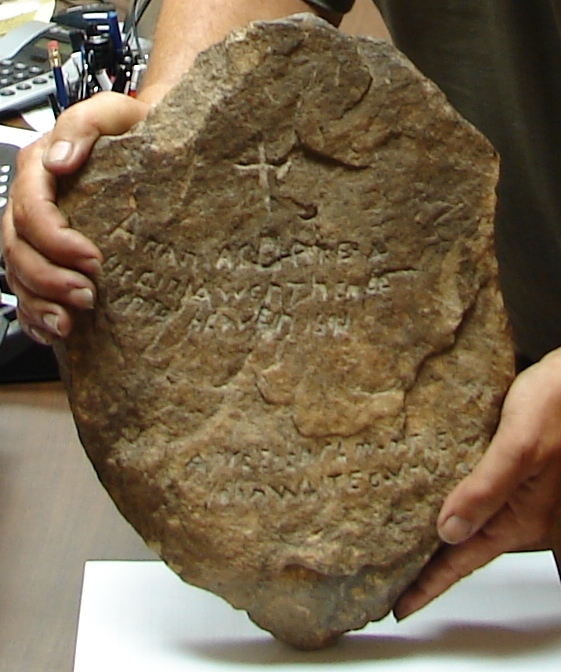 One day, in 1937, a tourist found a stone with what appeared to be Elizabethan English words on the banks of the Chowan River near Edenton, North Carolina. Eventually this stone found its way to the desk of a professor at Emory University, by the name of Haywood J. Pearce Jr., an authority on fourteenth to seventeenth century English writing. He aroused the interest of his father, Dr. H J Pearce Sr. , then President of Brenau College in Gainesville, GA. Then, in 1939, a “Bill” Eberhart, of Fulton County, GA was traveling by automobile through the upcountry of South Carolina. He pulled over to take a nap in his car and realized that he had a flat tire. He used a stone that he picked up in a clay ravine to help raise his car from the ground. He noticed the stone had writing on it. He was curious and went back to the ravine and found twelve more similar stones. The site of Eberhart’s discovery was a hillside on the Greenville County side of the Saluda River some twelve miles below Greenville just outside the town of Pelzer on Hwy 20. The story told from these stones is indeed amazing as it tells of a 350 mile trek begun by one hundred and seventeen settlers of the Roanoke Colony to the southwest through North Carolina into South Carolina. By the time they arrived near the hillside by the Saluda River, their number had diminished to twenty four. At this place, the band was attacked by savages, resulting in seventeen additional persons killed, including Ananias and Virginia Dare. The seventeen were then buried on that hillside. It is said that WWII precluded further study of the stones and that Dr. Pearce Sr. died in 1943. Additionally, his heirs sold the Pelzer hill to P. M. McClane for $700. Although no conclusive statement can be made about the stones, is it possible that the blue-eyed Lumbee Indians of the Laurinburg area of North Carolina, and the bearded Keyauwee Indians who lived near the Chattahoochee River, could have acquired these characteristics from intermarriage with remnants of the Roanoke Colony? This entry was posted in Croatoan, Keyauwee, Lost Colony, Lumbee. Bookmark the permalink. Very close to home Roberta, thanks ! This area is full of artifacts that have yet to be discovered. My mother told me about living in North Greenville beside a pasture that was once an old Indian camp. She and her siblings would play there as children and found several Native tools and arrowheads. I asked her why she didn’t take any of them home and save them. She said, “they were just old knick-knacks, what were we going to do with them ?” I think I just looked at her for a moment in complete silence after that !